I promised more towers a few weeks ago. It started with this view across the lake in Victoria Park which somehow mimicked a stately home in the distance across landscaped gardens. If you look more closely you can see that it is actually a residential tower block - the Cranbrook Estate. A little closer again and you'll find low rise buildings and secure housing, built around the lovely lines of the Frink Blind Beggar. Walking back home from the park, you pass Lake View, another Lubetkin building, looking across the lake and park. I've walked past these buildings for years and pretty much ignored them. It's as if I was too close to see them. Recently I've viewed them in a different light and recognised the scale of their no-nonsense ambition. 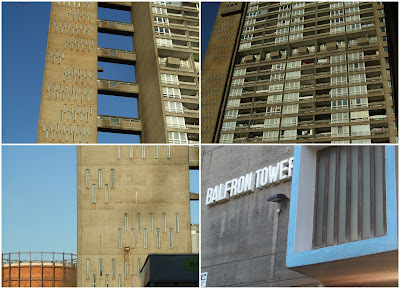 I got talking to a chap in a cafe, as you do, and it turned out he had had an exhibition of his paintings in one of the flats in Balfron Tower, Erno Goldfinger's test bed high rise for the more famous Trellick Tower. I'd noticed it in the local paper and meant to visit on the way back from the allotment but daydreamed past. So I missed Peter Wylie's paintings of the building, a glimpse inside the flat and the Balfron Tower biscuits he'd made for the occasion. I can live with that because I now have this. It's the Clothkits Trellick facade skirt in - wait for it - Municipal Green and Eau de Nil, The fabric has a lovely sateen finish and it has enough weight to make it hang nicely. I like to think of it as my Balfron skirt even though the windows facade is not quite the same. But love is a little blind, is it not? With thanks to Kate for putting me on to this some while ago and inspiring me to get out the sewing machine again. Balfron Skirt. Yes, very like. Love it with those tights. Brown and grey have been replaced. Ali and I admired Clothkits at both Ryantown and the Museum of Childhood. I nearly bought one then, and I think I really must invest in one now. Your skirt is wonderful! Do elephants in England prefer buns? In America we grew up believing their favorite food was peanuts (not quite sure why!). Love that Frink sculpture but then I love Frink's work, full stop. Lived and worked close to Trellick Tower for many years, and had friends who lived in a flat about half way up the tower. (The views were fantastic.) So, perhaps I should whip up one of those Clothkits skirts too, a bit like wearing one's heart on one's sleeve. The pics accompanying this post give life to these structures I would noticed, if at all, as mid-century snazzy or early 70's Low-Bid kitsch. The skirt however, blows my mind. Some day, you'll look back at it and laugh. So you actually sewed yours. I'm impressed.